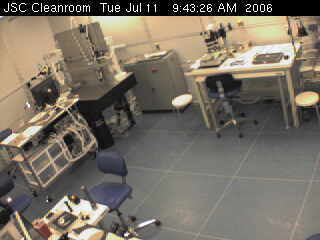 This is a view of the Stardust Cleanroom at the Johnson Space Center in Houston, Texas. The Stardust Sample Return Capsule arrived here on January 17, 2006. The time listed is in Central Standard Time (UTC - 6 hours). The webcam was taken down on July 11, 2006. Daily time lapse movies from January - July, 2006 are available.